EASA cares for the safety of the youngest aircraft occupants and recommends the use of approved child seats on board of an aircraft. Small infants are allowed to sit on the parent’s lap and be secured by a supplementary loop belt. A child over 24 months of age must occupy a separate seat. However, the normal seat lap belt in an aircraft is designed for the body of an adult person. It can cause injuries for children in an accident or during an aborted take-off. Children should be approximately 7 years of age or with a height of above approximately 125 cm in order to be able to use the standard seat lap belt. In an emergency, adult passengers release their seat belts by one single action. Certified child restraint systems must also have a single latch release. 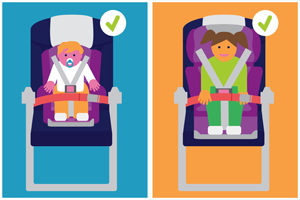 To enhance safety of the youngest passengers, EASA therefore strongly encourages that infants and small children be secured in an approved child seat, on a dedicated seat in the cabin. How this can be done depends on the individual airline. It is therefore important to check the airline’s website or get in contact with it. Please find here detailed information on approved child seats, as well as, information on how to prepare and what to do before your travel. Can I use a child seat on board for my baby/child? What about a rear-facing child seat?